Tours take place each Saturday at 11am, tickets on sale from 10.30am cost £5 | There is a special candlelit opening on the first Tuesday evening (6pm-9pm) of each month. An appealingly higgledy-piggledy treasure trove of artefacts, the extraordinary Sir John Soane's Museum elegantly located on Lincoln's Inn Fields is well worth an exploratory rummage. Lurking in nooks and crannies within the sprawling rooms and halls of neo-classical architect Sir John Soane's former residence are over 30,000 architectural drawings and antiquities. Works by Turner, Canaletto and Piranesi feature in the painting collection, with William Hogarth's eight canvasses of 'A Rake's Progress' forming the centre-piece. Each of the many spaces in this museum has its own strong identity and appeal and in 2015 Soane's private apartments and Model Room, not been seen by the public in over 160 years, were opened revealing Soane's Model Room, bedroom and Mrs Soane's Morning Room. From the domed ceiling of the Breakfast Room and the Gothic library, to the study with its Roman architectural fragments and the two courtyards crammed with ancient stonework, this is a house of diversity and architectural merit. One of the most intriguing rooms is the Picture Gallery. Here, walls made up of large folding panels unravel to reveal a host of pictures that would not normally have been accommodated in the small room space. Panels are opened on request to groups. Look out for the alabaster Egyptian Sarcophagus of Seti I dated 1370BC appropriately located in the basement 'Sepulchral Chamber'. 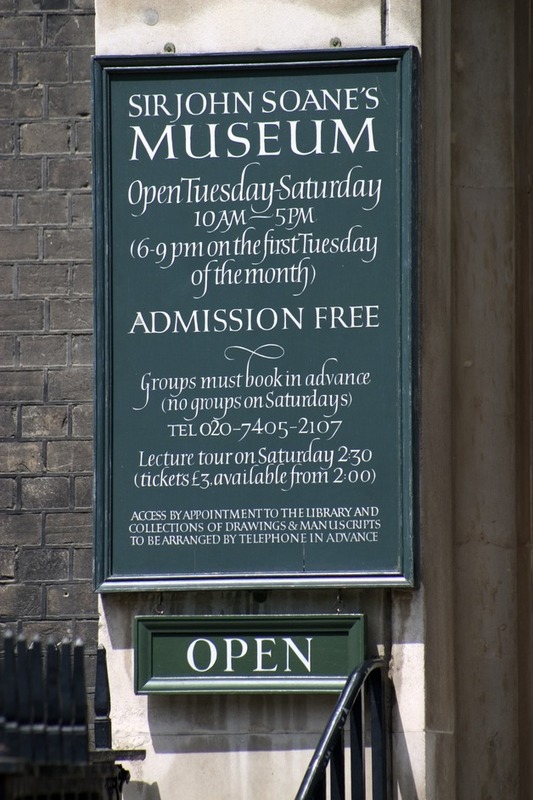 Museum tours take place every Saturday at 11am. Neoclassical nooks and crannies, architectural gems, bones and stones. A major exhibition exploring the role of drawing in contemporary architectural practice through the work of one of Britain's leading architects and architectural draughtsmen. What are the best dining options near Sir John Soane's Museum London? Sir John Soane's Museum gyms, sporting activities, health & beauty and fitness. The best pubs near London Sir John Soane's Museum. Sir John Soane's Museum clubs, bars, cabaret nights, casinos and interesting nightlife. Where to have your meeting, conference, exhibition, private dining or training course near Sir John Soane's Museum. From cheap budget accommodation to luxury 5 star hotels see our special offers for Sir John Soane's Museum hotels, including Grange Holborn Hotel London from 81% off.